The famous co-founder of Apple Inc., died today (October 5) at age 56. In a brief statement, Apple announced the death of their visionary leader, but did not say where he was when he died. 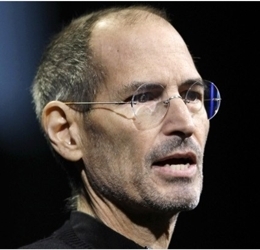 Mr. Jobs suffered from a rare form of pancreatic cancer and had a liver transplant in 2009. He stepped down as Apple’s chief executive on August 24th. Jobs introduced simple, well-designed computers for people who were more interested in what technology could do rather than how it was done. Jobs was considered to be the key mind behind the company’s visionary products. The deceased CEO will live on through his products. An original thinker Jobs helped create the Macintosh which was one of the most influential computers in the world. Jobs also reinvented the portable music player with the iPod, launched the first successful legal method of selling music online with the creation of iTunes, and reordered the cellphone market with the iPhone. The introduction of the iPad also jump-started the electronic-tablet market, and it now dominates the field. Mr. Jobs had a genius for understanding the needs of consumers before they did. Calculating that people would be willing to pay a premium price for products that signal creativity, he started a chain of retail stores and pushed consumers away from their dependence on floppy disks and CDs. Known within the technology community for his complex and combative temperament, Mr. Jobs was a private man. But in a June 2005 commencement address at Stanford University, he talked about his pancreatic cancer, diagnosed in 2004, in a video that became an Internet sensation. He later became furious at speculation over his health in mid-2008, when he appeared in public looking gaunt. In late 2008, he took a medical leave from the company, and he had a liver transplant the following year. In January of 2011 he took another medical leave. On Aug. 24, 2011 he stepped down as Apple’s chief executive but became chairman of board. The Apple campus flags were reportedly flying at half staff. This entry was posted on Wednesday, October 5th, 2011 at 9:55 pm	and is filed under Hair. You can follow any responses to this entry through the RSS 2.0 feed. Both comments and pings are currently closed.